WP 4 concerns the development of a software application that could be used by the Local Observatory on Poverty and Social Exclusion (see WP 3) to monitor Laeken indicators at LAU1 and LAU2 level and to disseminate results to improve the knowledge of the phaenomena and the local social policies. 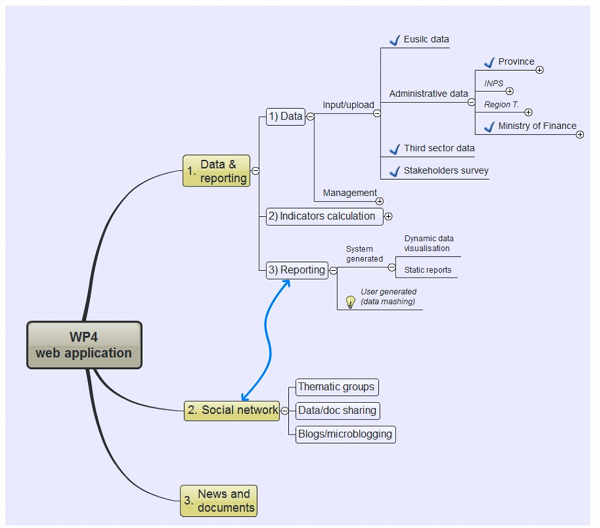 The software allows to store and update the raw administrative data locally available (see WP 3), to link them with EU-SILC 2008 oversampling micro-data, to estimate indicators using correction models based on small area methodology (see WP3, task 3.3), to disseminate results between local stakeholders, promoting their capabilities in fighting and preventing social exclusion. share knowledge and improve local capabilities. The long-term objective (outcome) of WP4 is to improve the understanding of the social exclusion processes at a local level by all the persons working in the field of social policies making. In this way we will contribute to improve the impact of the policies preventing and fighting agains poverty. The activity of WP4 depends strictly from the results of previous WPs, mainly WP3. The methodologies and the algorithms developped in WP1, WP2 and WP3 will be standardized and integrated in the final application. 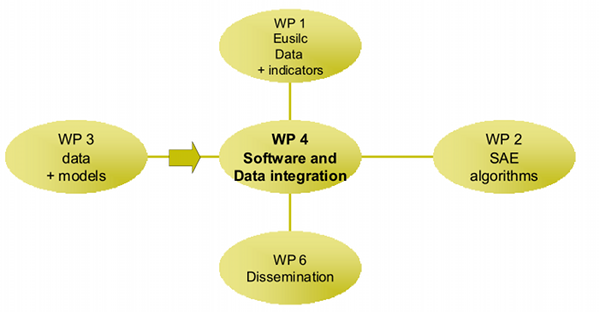 There also a strict connection with the WP6 (Dissemination) because the software will be the main instrument to share and disseminate SAMPLE results and methodologies (Figure 1). The application will have three main functionalities: a Data Management and Reporting area, a set of Social Networking tools and a News and Documents module (Figure 2). This software will be an online web application, built with open source solutions (MySQL RDBMS, PHP and R languages, Google Visualization Tools for reporting). The data visualization and reporting module has been planned refering to the best practices in the field of statistical data representation (www.gapminder.org, www.visualizingeconomics.com, manyeyes.alphaworks.ibm.com/manyeyes/, www.city-data.com, www.perceptualedge.com, www.livingwage.geog.psu.edu, and many others), and will take into account the debate started by the "Open Government Initiative" stated by President Obama's administration in january 2009 (cfr. www.data.gov, http://sunlightlabs.com). A simple web interface will allow administrative users to easily load raw statistical data and apply R engine calculations by selecting a few input parameters. The calculated data (indicators) will be saved on a MySQL database. A subset of this indicators database will be also exposed as a web service with a Google wire protocol compliant datasource. Using theÂ available visualization applications, the general public will be able to create reports and dashboards based on SAMPLE database. On the front-end, the website will show data under a set of interactive graphic visualizations made using Google Visualization APIs. The application will be based upon a social networking tool, to promote the involvement andÂ collaboration of local stakeholders. Our platform of choice will be the Elgg framework (http://elgg.org/), which comes with advanced user management and administration, social networking features, cross-site tagging, a powerful ACL, internationalisation support, and more interesting features. For more details see WP1, task 1.4 and WP3 reports. Apart from data gathered within Sample project, the application will be a portal for collectingÂ various documentation, other statistics and news of stakeholders' interest.